Fifty years ago, the first commercially available wah pedal hit the market bearing an image of horn player Clyde McCoy on its bottom, referencing the effect’s ability to mimic the vocal character of a plunger mute. It soon became a phenomenon as more guitarists and builders discovered the appeal of its gliding frequency sweep. The effect was something of an accidental discovery that developed as Thomas Organ Company set out to build a new amp in the mid-1960s. Del Casher, consulting with the company at the time, would go on to modify and use one of the prototype wah pedals with his guitar. Later Vox and Thomas Organ Company would mass produce the pedal. However, neither Thomas Organ Company nor Vox registered the name “Cry Baby” as a trademark, which left the door open for Dunlop to take it and run with it years later. 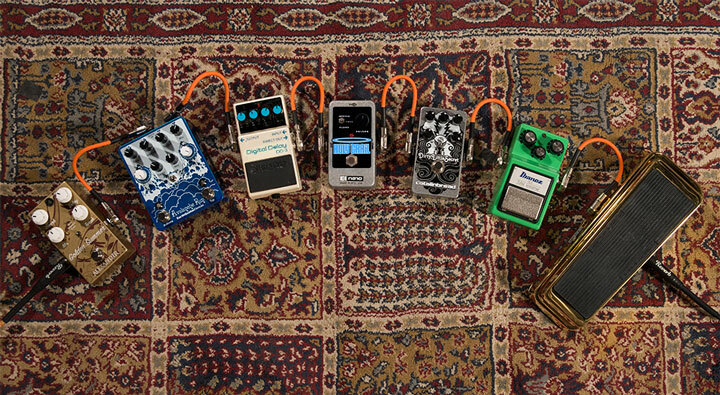 Over the past couple decades, Dunlop has released a staggering array of Cry Baby models, including the ubiquitous workhorse GCB-95, the pedalboard-friendly Mini Cry Baby, and a slew of signature models. To mark the occasion, they’ve now debuted a shiny gold 50th Anniversary Edition Cry Baby, set for a spring 2017 commercial release. What better opportunity to pay homage to all the great wah riffs recorded in the last half century. Not all riffs Joe plays in the video were originally recorded with a Dunlop Cry Baby wah, and not all them were played with the same pedal action that Joe uses (for example, Jimmy Page didn’t really move the wah on the studio version of the “Whole Lotta Love” solo). But this is a tribute - a celebration of wah - not some attempt at perfect recreation. If you’re curious, Joe used a Gibson Les Paul Studio into a modern Supro Black Magick amp. After the wah, he’s running an Ibanez TS-808, a TC Electronic Holy Grail, an Alexander Pedals Golden Summer, a Boss DD-3, a Catalinbread Dirty Little Secret, and an Earthquaker Devices Avalanche Run (for the ending on “Frankenstein”).